Need a knowledgeable horseperson to help you buy your next horse buddy or sell a horse that is moving on? We are here to help! Contact us to help you with all of your horse buying and selling needs. We can help you with everything from searching, inspection visits, listing, contracts, vet exams, shipping, insurance, trial periods, etc. Make your purchasing and selling experience a good one! Leasing a horse allows a rider to bond and develop a relationship with that one special horse. The rider can experience the joys of having their own horse without the responsibility or commitment of actually owning the horse. Leasing can also be a great step towards first-time ownership. If you would like to bring your horse and use our facility, just give us a call! Pay by the visit or by the month. Day camps will be offered during summer and school breaks as well as other times of the year according to demand. The participants will be grouped according to rider level (i.e. beginner camp, intermediate camp, adult camp, etc). Day camps will incorporate riding lessons as well as crafts, games, and other fun activities. Equine education will be the first priority. Camps require a $50 deposit and will have a limited number of spaces. 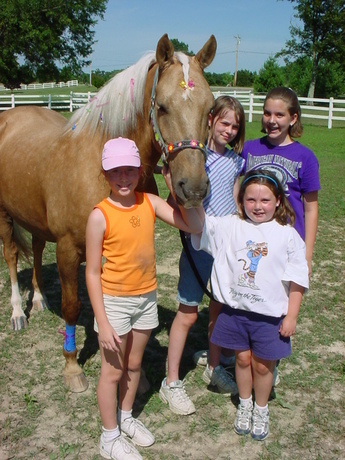 Badge clinics are provided to Girl Scout and Boy Scout troops to assist them in meeting the necessary requirements for their horse-related badges. All clinics are informational and do not include riding. Badge clinics last approx. 2 hours and cost is $50/troop.